Approach businesses with a lot of employees like manufacturers, hospitals, your suppliers, banks, etc. and tell them that as an added benefit for them to offer their employees, any of their employees can use a discount card that you provide them with for free diagnostic or a planned service tune up or a discounted price on the repair. I knew one owner who had a relative working for a major airline in the area and they distributed this offer in 3,000 paycheck envelopes each month. 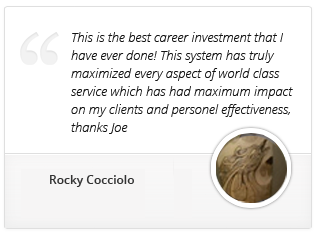 Talk about finding your perfect customer – a busy professional where time is a premium for them looking for premium services… Jackpot! Think of the most influential people in your community. Police stations, firehouses, or any office or business that people look up to and trust. Send a pizza over to them once a week or once a month – or pay for lunch for the office. Of course, with a note from your company on it. When they have a question about a faulty furnace or find a carbon monoxide problem in someone’s home, who will they think of? YOU! Buy lunch for other centers of influence like maybe your hair stylist once a month. Ask them if you can leave some flyers on the counter at their shop. You’re IN! Many companies have a referral system that their customers never even know about – because the company doesn’t bother to tell them about the program! Make it a habit to send out a card after each service, sales, or installation transaction letting your customers know that they get $10 cash if they refer anybody and $50 if it turns into a bigger job. Have someone at your office hand address each postcard as they file your service tickets away or print out labels from your computer program each week sending the card out to every customer you went to this week. When you give planned service to a customer, it’s more tangible than just giving them money. I have a friend in the business who gives a customer one more year of heating or cooling planned service for each customer they refer to him. My suggestion is that once a customer has amassed 5 years of planned service, you start giving them $50 gift certificates that they can use for any of your services. Offer a free second opinion on any repairs that a customer is considering from your competitors. Think of how many residents might take you up on a second opinion on a condemned heat exchanger, for instance! This is an easy offer to tack on to any of your current marketing or advertising and can yield a lot of new customers! You’ve heard of referral groups in your community where non-competing local businesses get together and refer business to each other. Why not start your own? Create a flyer inviting local businesses to become part of a referral group in your area. Let them know that the group will meet monthly and that there will be only one business in every category allowed into the referral group. Make sure you create a referral board that votes in any new members who are allowed to join. Only include small businesses that need customers into the group – not superstores or other manufacturing type businesses. Not only will this generate referrals from within the group, but it’s a great way to become a center of influence in your business community. You can even approach your chamber of commerce and see if they will sponsor the group. Give your existing customers two coupon books – each offering a free consultation with you about the topic of their choice: drain cleaning, kitchen or bath remodeling, landscape lighting, indoor air quality, saving money on utility bills, how to cool your second floor, etc. Ask them to pass one of the books to a family member, friend, or colleague. You can distribute the coupon books through your techs, through your networking groups, or through other professionals you do business with. You know how the boy scouts, little league or other local organizations are always looking for a donation? Why not give them a free service like a tune up, or a planned maintenance agreement for them to raffle off? I used to donate free thermostats (that would have to be installed by us) to the church my parents belonged to. We got many great customers from this arrangement. So much so that I began donating 6 of them to give away at a time. Once my service tech was in front of them, he sold other items like humidifiers, air cleaners, and maintenance as well. There are disaster recovery businesses that specialize in restoring fire or flood damaged homes to their original state. They also do things like mold and radon mitigation as well. These businesses are masters of referral marketing. They have called on thousands of plumbers, HVAC, electrician and remodelers to ask if they could do talks with their employees. I would recommend getting involved with these companies as a way of finding customers who REALLY need your services right now. Once you get in their network and perform your services with quality and speed you will get repeat business forever. Stay away from companies that are only shopping low price and don’t value speed or quality! These companies will roll your services into their quote to insurance companies, and they know how to negotiate. Also, many of them will give YOU a referral fee for leads that turn into jobs for them. I have seen many companies rack up over $10,000 per year in referral fees they collect. An HVAC salesperson I know gets a written testimonial on every sale he gets. He uses this thick stack of testimonials to sell his jobs and to build credibility in the quality of his work. After all the work is done, the customer is happy and the job is paid for, he pulls out a $50 bill and asks the customer for a letter of testimony. If the customer writes a testimonial on the spot he gives the customer the $50 bill for their time. He gets a testimonial every time. Then he takes a picture of the customer and creates a customer of the week advertisement in the local paper. Note: He tells the customer the week before that they will be in the paper. The customer then looks for the ad and tells their friends about the ad. Try sending out a letter to homeowners on the same block as a multi-day job using a radius mailer. Tell them what kind of work you’re doing, apologize for the mess, and offer a 50% off a service diagnostic, a free camera job, or anything related to the work you’re doing to anyone who responds while your trucks are in the neighborhood working. Institute a program to pay your own employees up to $50 for any customer that they bring in and schedule with the company. If they schedule the job, the first $50 of the job is theirs in cash. One company I knew told a prospective employee about this program during a job interview and the next day called to schedule 17 new customers for $79 furnace tune-ups before she was even hired. You could probably guess that the company hired her and had seventeen $50 bills for a total of $850 in cash waiting for when she arrived for her first day and presented it to her in front of all of the current employees. That week, the company set a new record – 63 jobs! All referred by employees during a slow week in March. They wound up doing an incredible $83,465 in sales from those jobs. Wait two or three days after doing a job and then send a balloon bouquet to the customer’s place of work thanking them for their business. Obviously, all their co-workers will want to know who sent the balloons! In the bouquet, provide 50 referral coupon cards so that whoever wants to get a new system or service performed on their current unit can call you directly! Use the space on the back of your business card to tell all your customers exactly what’s in it for them if they refer a client to you. It’s also a good idea to give the new client the same discount that you are giving as a referral fee so everyone wins. Get out your old phone books or go to the library and look back at the chamber of commerce member lists throughout the past 10 years and determine which companies that do the work you do have gone out of businesses. You’re likely to find that none of their phone numbers have been reassigned or re-sold. You can buy the number cheap, and you might be surprised how many calls still come into those old numbers. Free business! Teach your techs to ask about homeowners associations as they work in different neighborhoods. If there is an association, it’s likely they have a newsletter, a website, or regular meetings. Find the person who’s in charge of the communication for the association and ask if they can include a page about a discount that you’re are offering to all of their residents. You could even offer to pay a portion or all of their mailing costs. You can take this a step further by then offering to show up at association meetings to do educational talks on your area of expertise. Think this might work? I know one guy who booked over $200,000 from just ONE such community with this strategy! Ask local churches if you can help defer the cost of making up their bulletins by paying for the printing. In the case of one company I know, the church gave him their congregation mailing and phone list. The contractor augmented this effort by offering a special deal on fall and spring maintenance for the members. You can take over your area church by church. Sometimes we completely overlook the best solutions. How many people do your mom and dad know? In my case it’s plenty. My mom is like the “Church lady” who knows everything about what is going on at the church. Her phone is ringing like Grand Central Station with requests from the church about everything from altar flowers to chicken dinners. If your parents are active seniors, give them a stack of special discount cards for their friends to use with your company. Who loves you more than your mom? You know they love to brag about you, so use this power in your marketing mix. Princess Di was famous for writing notes to people to enlist their help in the causes she was part of. You can do the same. This is basically a “Thank You Card” program in which all your employees are responsible for sending handwritten, customized thank you cards to your customers. Utilize everyone – salespeople, technicians, dispatchers, CSR’s, managers… and YES… the owner. The thank you card should have a note that asks the recipient to tell others about your greatest challenge. That challenge, of course, being that you need their help in finding and keeping great clients like them. Ask them If they were you what would they do to find more customers like them. Charities love referrals! Approach a local charity and get a list of their corporate donors. Approach those donors and offer to donate a percentage of sales that result from the patronage of their employees to the charity of their choice in the name of their company. This same strategy could be used with any church or other organization. If you send out any invoices to customers, offer to deduct $20 off of their bill if they refer a new customer to you. Consider what it costs you to get each new client. (More than $20!) Another way to do this is to send out a sheet with 10 blank lines with a $20 deduction off the bill if they are filled up with names, addresses and phone numbers. Send an ad or letter out to a neighborhood saying that you’re holding a “(Name of Their Subdivision) Day.” Explain that your trucks will be in that neighborhood for that day only and if at least 12 people order tune ups on that day, you will do them for half price or whatever discount you choose to offer it at. Another variation of this is that when your salespeople or techs are in a home in a certain subdivision, they could tell the client that if they can get another client from the same neighborhood to replace their equipment or order their tune up at the same time that they would receive a special group discount. If you have a nice conference room that’s often unused, you can offer the use of your room to other businesses and organizations. You can also consider other assets that you have that customer may need. Things like having your neighborhood use your shop as a school bus stop shelter. If you have a large property you can hold neighborhood block parties or birthday parties. This gives businesses, organizations, and people from your community a chance to come into your business and get to know you. You can provide welcome packet or a gift bag full of coupons of gift certificates to all who attend. Eventually, most salespeople are asked if they know anyone who could install the materials they sold, or if they knew someone who does certain types of work. There’s lots of business to be had this way! NOTE: This works best for leads directly with homeowners… not with contractors. Time to Put it in Play! With all of these free or inexpensive strategies at your disposal, there’s nothing keeping you from generating tons of referral leads for your business – even in the slow months. Put #1 into action today and then pick another 3 or 4 to implement in the next couple of weeks. Try different ones over time, and eventually, you’ll find a mix that keeps your team running hard – and keeps the revenue flowing for your business! And once you get all those referral leads, you’re going to want to close as many as possible. 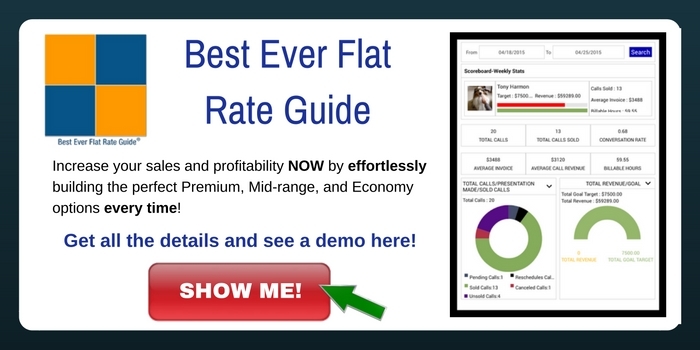 Our Best Ever Flat Rate Guide ensures that your techs and salespeople present the perfect options every time – and it’s super easy to use. Click here to learn more, or click the image below. What’s been your experience with referrals? Do you have any referral success stories to share? Tell me your best lead generation techniques in the comments.